Director, SEBI provided vital information about the functioning of SEBI. Prof. Aanchal Arora anchored the programme in a wonderful manner. Around 100 students as well as faculty fromvarious departments of Khalsa College participated in this programme.Dr. 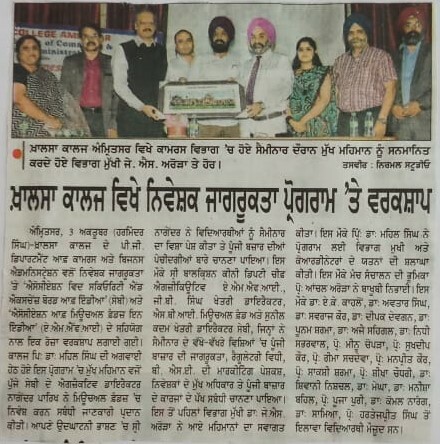 A.K Kahlon, Dr. Avtar Singh, Dr. Sawraj Kaur, Dr. Deepak Devgan, Dr. Poonam Sharma,Dr. Ajay Sehgal, Dr. Nidhi Sabharwal,Prof. Meenu Chopra, Prof. Sukhdeep Kaur, Prof. Reema Sachdeva, Prof. Manpreet Kaur, Prof. Aanchal Arora, Prof. Sakshi Sharma, Prof. Shikha Chaudhary, Dr. Shivani Nischal,Dr. Megha, Dr. Manisha Behal, Prof. Pooja Puri, Dr. Komal Narang and Dr. Samiya, Prof. Hartejpreet Singhactively participated and contributed to the success of the programme.